Puppet Labs released a major product last week, Puppet Enterprise, an integrated bundling of the open source automation platform, Puppet, and several of the other tools needed to get up and running fast. 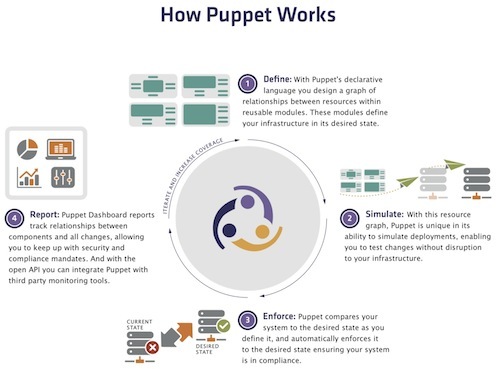 The Puppet Enterprise release is firming up Puppet Lab’s efforts in the mainstream world of enterprise datacenters and IT. While they have plenty of cases of round-corner cool kids using their stuff – Zynga, Google, etc. – the majority of customers (as distinct from “users” who may or not pay) for any IT Management space are far from anything thrilling that ends in “.com.” I say this as someone who actually covers this space and likes it: personally, I don’t think it’s “boring,” but it’s not iPhone vs. Android, if you catch my drift. Still, you out there know, dear readers, the model-driven automation space that Puppet helped pioneer is actually very exciting: there seems to be genuine innovation that leads to better IT Management going on in that market. The idea of Puppet Enterprise is to bundle up SLA’ed support options along with a certified, bundled stack of all the stuff you need to get up and running with Puppet. Having this “polished,” productized version of the open source platform is welcome, of course. It’s one thing to download the open source bits and cobble them together for free, and a nicer, though not-free experience, to have things all arranged for you. The promise of Puppet and other next generation, model-driven automation tools on the market now is to speed up the time it takes to provision and update IT resources. Get new servers running, manage the software on desktops, and otherwise get a machine from bare-metal up and running with all the software and configuration needed to start using it. When talking with Puppet’s CEO on this release, he told me that one customer had seen Puppet made their configuration rates 53 times faster. If you can speed up the process of configuration management that much, you, the IT folks, buy yourself a lot of time to (a.) do other, more important things, and, (b.) amaze The Business at how fast you can actually spin up new resources for their use.